Countless old school mixed martial arts pundits threw tantrums when the UFC announced reigning welterweight king Georges St-Pierre (Pictured) would make his next title defense against Nick Diaz, a fighter who is coming off a loss and is currently serving a year-long marijuana drug suspension, instead of Johny Hendricks, who UFC president Dana White dubbed as the division’s top contender just one month ago. What really irked people was that GSP vs. Diaz came on the heels of the promotion confirming Chael Sonnen had talked his way into a fight with light heavyweight champ Jon Jones, despite the fact Uncle Chael hadn’t competed in the weight class in nearly seven years and is also coming off a defeat. Is there no longer a pecking order in the UFC? Is the organization only arranging scraps that will sell pay-per-views? Well, according to White, Octagon officials weren’t planning on having St-Pierre meet Diaz next. 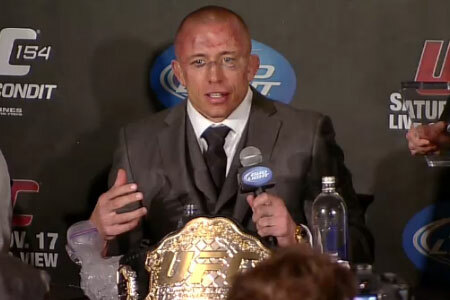 They only decided on that matchup after GSP asked them to do him a solid. “The guy’s never asked us for anything,” White said of St-Pierre’s request. “He’s an awesome champion, he does anything we ask of him and he asked us for a favor. He wants to fight Diaz. It’s not like people don’t want to see it. The UFC didn’t do that, the champ did. The champ called him out and wanted to fight him. So the UFC didn’t do it, the guy who held the belt did. The bright side for Hendricks, White acknowledged if he beats Jake Ellenberger at UFC 158, he will get next dibs at the 170-pound crown.